Opinions are the most common type of thoughts and these are reflected in all online and offline conversations. Major corporate decisions and family decisions are all by-products of opinions. By the very meaning of the word, opinion - the judgment or viewpoints about a product, person, idea or experience or event need not be based on facts or knowledge. There can be 'felt-opinions' and 'fact-based opinions'. These are viewpoints of a person or group of persons or institution about a thing or person. Hence, it is not an exaggeration to say that management of opinions, creating a favourable opinion about oneself or the marketed product/service/idea/event/experience is very much a marketing manager’s day-to-day job! Favourable opinions need to be built and constantly nourished. If for example, Company A has a leading brand of paracetamol, the marketer is bounden to constantly present a genuine engaging story, represent authentic talking points and provide evidence for the same, so that the favourable opinion on Brand A paracetamol for the management of fever and pain, gets nourished. Thus, an important end-point of marketing messaging is certainly: maintaining favourable opinions among stakeholders (consumers and influencers included) about the marketed product, service, idea, experience or event. So what are the ingredients required to whip up a potent marketing approach that results in favourable opinions? b) Engaging messages: products do not sell unless backed by messaging, to invigorate the customer or prospects regarding the benefits of consuming the marketed entity. Actually, a customer is buying an image or benefit(s) of a marketed entity. For this to happen, the messages should have potency and creativity to inspire target audiences to experience the marketed entity. Glamour, appeal, highlighting the USPs (Unique Selling Prepositions) and multi-media messaging will facilitate consumption of the marketed item. Messaging should be so attractive that it should go viral or instigate positive word-of-mouth. c) Gaining feedbacks/having dialogue with constituents: in this age of the ‘prosumer’ and customization, it is inevitable that the marketer listens and appreciates the points elucidated by his target audience. Taking a lead from this melange of messages from the consumer fraternity, channel partners and other stakeholders, it is vital to improvise the bundle of offerings to provide a more satisfying experience to the customer. The customer has insatiable appetite for customer satisfaction…yeh dil maange more! d) Making availability: easy access to the marketed entity (product, service, idea, experience, event or entity) is a key feature to build favourable opinions about the marketed entity. Hence, 24/7 call centres provide after – sales support to various items. Similarly, service engineers, sales personnel and MRs remain accessible to prospects and customers to facilitate the sale. Having a large number of easily accessible points-of-purchase is key feature for sustained success of a product or service. Repeat customers are vital for continuous success and it is possible only with easy access to the marketed entity. e) Continuous improvement: success is a moving target; one cannot rest on one’s laurels. New benchmarks are constantly set by demanding customers and belligerent or aggressive competitors. Hence, one should necessarily continuously upgrade the customer experience; ‘under-promise and over-deliver’ is a nice aphorism in this game. New market gaps should get identified and filled - thus, reinforcing success repeatedly. 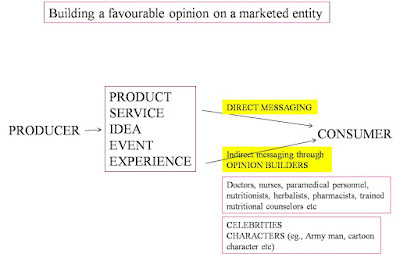 f) Use OPINION BUILDERS: celebrities, experts (like doctors, nutritionists, beauticians, hair stylists, image makers, consultants etc), and characters not only aid brand recall, they help mould favourable opinions. If Shah Rukh Khan endorses Hyundai cars for a decade, he may not be an automobile engineer, but this celebrity endorsement builds trust, brand image and favourable opinion (hence, favourable word-of-mouth and publicity). This aids in the purchase decision making by a prospect. Doctors are the favourite and logical or inevitable opinion builders and influencers for sales of pharmaceutical goods. Other healthcare items (like dental products, nutraceuticals, nutritional products like milk mix beverage powders, hearing aids, and other medical or healthcare devices) also obtain better sales boost when doctors recommend them to the target audience. 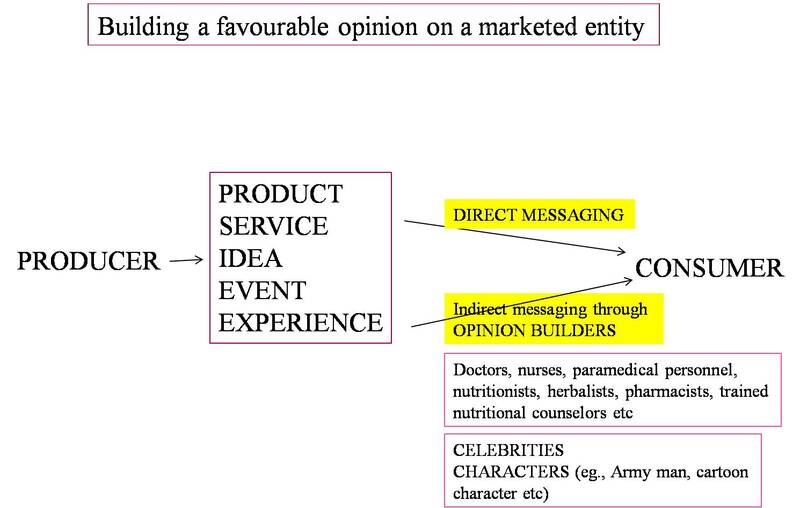 There is great power of an opinion builder in an apron, for healthcare goods and services! Characters can also help strengthen favourable purchase decisions. Example: an army man character (caricature or actor in army fatigues) will help build a positive opinion for products associated with strength, for instance: dental creams or toothpastes for strong teeth; or milk mix beverages for adults…). Popular cartoon characters also feed good opinions on products or services. Example: Chotta Bheem for a toothpaste item (makes teeth stronger)! One of the most unique opinion builders in recent times, is Baba Ramdev, who has created history with establishment of Patanjali range of herbal and Ayurvedic products, and food products. Patanjali products has only one brand ambassador: Baba Ramdev. It is his aura that is fueling favourable opinion among prospects and customers for Patanjali products. It is a unique case study of a Yogi opinion builder. (Another Guru is Sri Sri Ravishankar: Art of Living who has also launched a slew of products, of which, Tejasvita, a milk mix beverage is creating a mild sensation in the marketplace). Right use of relevant opinion builders will strengthen the opinions people have on healthcare products (including prescription-only products). The right strategy and mix of messaging elements have to be applied so that customers sit up and notice messages about a marketed entity endorsed by opinion builders or influencers. Hope you liked the above post on opinion builders in marketing, please scroll down and read all other posts (click on older posts to read more posts) …recommend this blog to your acquaintances.